After watching the video, everyone in the room soon realized that Capt. Reynolds had a prosthetic leg. He then began to tell us the story about how he lost his leg following an explosion while deployed in Iraq. 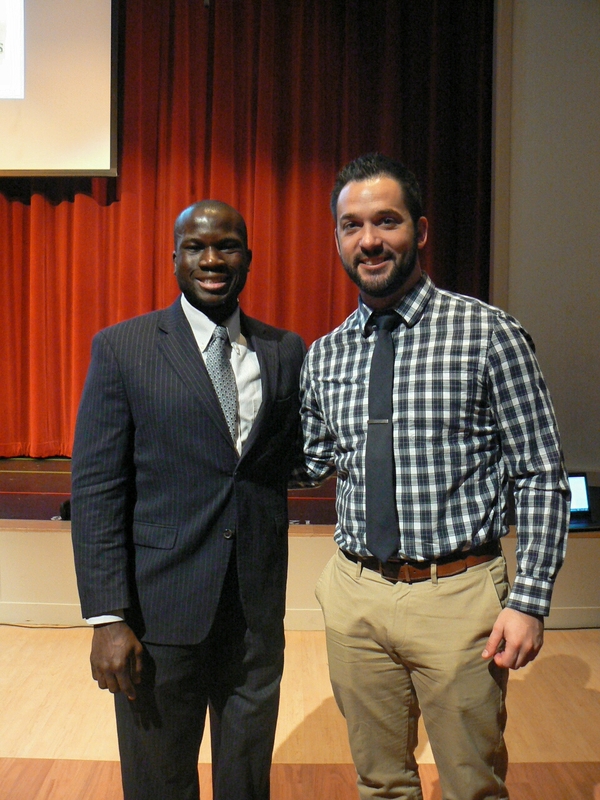 During the rest of the presentation, he shared inspiring stories, ideas, and advice to our middle school students. Finally, at the end of his presentation, he showed our students his prosthetic foot called the "Cheetah", which he uses to run and perform other physical activities. As soon as I saw his foot, I made an immediate connection to the current book I am reading, A More Beautiful Question. A beautiful question is defined as, "an ambitious yet actionable question that can begin to shift the way we perceive or think about something--and that might serve as a catalyst to bring about change" (p. 8). But having a question is just philosophical thinking. In order to bring about change, Van had to begin trying to answer his own question. He had to turn his question into action. That is when Van had a breakthrough with Flex-Foot prosthetics, which completely revolutionized the prosthetics industry . His new "Cheetah foot" was a curved blade that resembled the letter "C" and acted as a springboard propelling the user forward. Van's invention was able to help so many amputees walk, run, and engage in physical activity again. Most famously, Oscar Pistorius used this prosthetic "Cheetah foot" on both legs when he competed in the 2012 Olympics. It was such an honor to meet Will Reynolds and to see the true power that a question can have. If it weren't for Van Phillips, Will Reynolds might not have been able to accomplish the goals he had after his leg was amputated. Fortunately, as an accomplished athlete prior to his injury, combined with new technology in prosthetics, Reynolds began cycling as part of his rehabilitation and now races on a competitive team. More impressively, Capt. Reynolds has also competed in the Invictus Games for wounded warriors, winning four bronze medals at the 2014 event in men’s classified 100-meter and 200-meter athletics sprints, the Road Race, and the Time Trial in cycling. Van Phillips continues to ask questions such as, "Why does it have to cost so much? What if the design were tweaked in some way--through new materials, different processes--so as to make the limb accessible to more people? How might I make that work?" (p. 38). To this day, Van Phillips has never lost sight of his original question and is still passionate about the innovation of prosthetics. I think this is such an amazing lesson to share with our students. The lesson -- that questions can be incredibly powerful -- if there is dedicated action following the questions. Let's get our students excited about asking questions. Let's keep them excited about asking questions. And let's challenge them to refine and to pursue their questions. Who knows ... they too, might be able to change the world one day. Is this a Googleable or a Non-Googleable Question? Berger, W. (2014). A more beautiful question: The power of inquiry to spark breakthrough ideas. New York, NY: Bloomsbury.